ZSP took part in the international day of action in solidarity with the workers of Visteon Cadiz Electronica who are fighting against the closure of their factory. 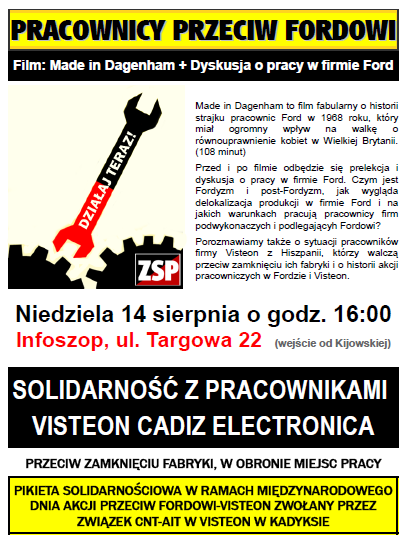 Our comrades from the CNT in the factory called for actions at Visteon / Ford so we visited the Ford Polska headquarters. We gave out leaflets informing about the situation; this followed some informational actions during the week which included postering and hanging info-exhibits on Ford dealerships around the city. On the same day, workers from the factory held a rally in Jerez de la Frontera. Unfortunately we were not able to go into Ford headquarters. We entered into the office compound and made some noise but were quickly surrounded by security guards. Since both Ford and Plaza Centers are located in the same building, we have been here numerous times in the past month, which makes it hard to get past the security. However, one comrade who went separately managed to get on the premises where he managed to distribute leaflets for quite some time. We will continue informing about this case and send our solidarity to our comrades who are fighting! 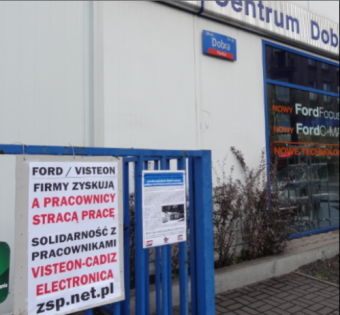 Around Warsaw, posters have been hung on Ford dealerships, telling the story of the struggle of the workers at Visteon Cadiz Electronica to keep their jobs. The informational action proceeds the next international day of action against Visteon/Ford which will take place on Oct. 14. The CNT in Visteon are fighting against the closure of the factory and the redundancy plan. The ZSP took part in the last day of action and also visited Ford headquarters a few more times. (Quite coincidentally, it is located two floors below Plaza Centers in the same building.) 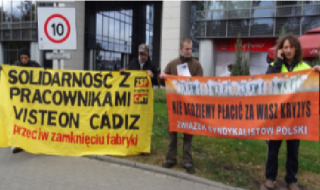 Members of ZSP also managed to show a solidarity banner to Jose Luis Zapatero on his recent visit to Warsaw. 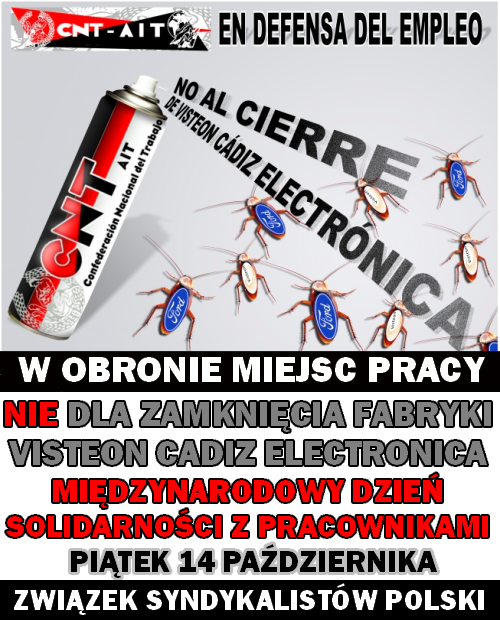 ZSP zorganizowało wczoraj akcje solidarnościowe z hiszpańskimi pracownikami Visteon Cadiz Electronica walczącymi z zamknięciem zakładu w Kadyksie. 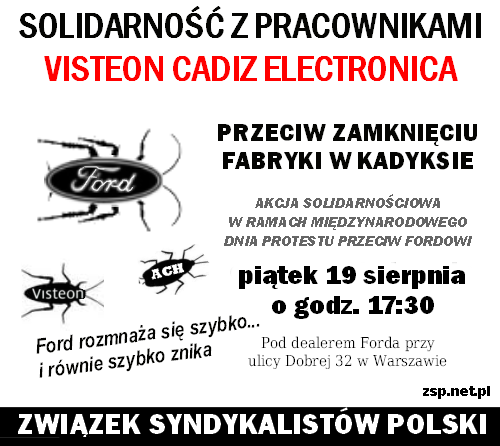 Akcje były częścią Międzynarodowego Dnia Solidarności przeciw Ford-Visteon ogłoszonego przez hiszpańskie CNT i Międzynarodowe Stowarzyszenie Pracowników. Visteon jest jedną z wielu spółek zależnych od Forda, które zostały stworzone, by zwiększać zyski firmy przez zlecanie pracy na zewnątrz, transferować środki poza firmę i dokonywać licznych kombinacji mających na celu unikanie płacenia podatków i spełnianie zobowiązań wobec pracowników. 450 pracowników Visteon w Kadyksie w Hiszpanii ma zostać zwolnionych, gdyż firma chce zarobić na likwidacji fabryki. Sekcja CNT działająca w zakładzie postanowiła podjąć walkę, w odróżnieniu od pozostałych związków działających w zakładzie. The ZSP-IWA stands in solidarity with the workers of the Visteon Cadiz Electronica plant, struggling against the closure of the factory. 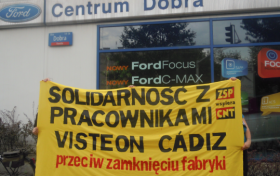 We took part in the International Day of Struggle against Ford-Visteon called for by the CNT and the IWA, organizing a couple of pickets and informing the public, which was overwhelmingly sympathetic, of the situation. Visteon is a company created by and dependent on Ford. Ford has created a network of legally independent companies through which it can outsource work, transfer funds and do all sorts of machinations to avoid tax liabilities and their responsibilities towards workers. Visteon/Ford also profits off opening up factories, shutting them down, moving money around to hide their wealth and even to cheat the workers. 450 workers in Cadiz face the elimination of their workplaces due to corporate greed. The CNT union section in Visteon is fighting against the closure, while other unions are engaged in a pantomime struggle, negotiating redundancy plans with the bosses. All our solidarity and support goes to the uncompromising position of our sister union in Spain, which does not accept the elimination of the workplaces and which seeks to mobilize workers to struggle and not give up.